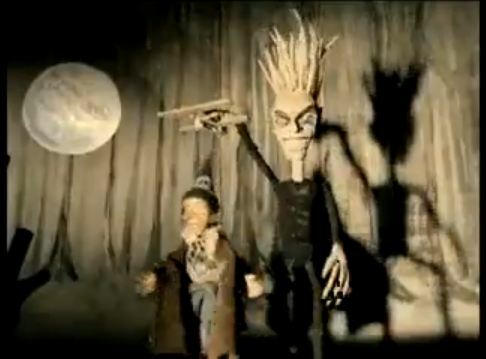 The ad opens with a stringed marionette Judderman, propelled jerkily across a puppet theatre stage with a backdrop of a moonlit forest. But the figure soon turns into the “real” Judderman, a spiky elf-like character, who is stalking a lone traveller through the wood, and luring him away from his path to a clearing where characters in fancy-dress are drinking Metz and experiencing “judders”. When he tries the drink, the traveller is transformed into a stringed puppet himself, controlled by the Judderman puppet. Why is the ad so uncanny? At first we see the puppet Judderman, who we can be fairly sure is an inanimate figure, but we soon see that we are mistaken, when the figure “comes alive”. We have the traveller, lost in the woods, who is bewatched but can’t see by whom. The trees themselves become animated, putting out roots which writhe along the ground after the traveller and later wrap around his discarded pack. There;s a raven perched on a branch and its head turns through 360 degrees. The whole stylised fee is of a fairy-tale nightmare, bringing back childhood fears which we thought we had overcome, which here nevertheless come to light to unsettle us once more. The ad appeared in the 2003 Channel 4 show The 100 Greatest Scary Moments at number 31. I would have placed it much higher!